This is a joke. A sick joke one of the others is playing on me. Ryder let out a shaking breath, digging his nails into the soft flesh of his palms as he shook his head vigorously. Thoughts tumbled one over the other in his mind, shifting against each other in a flurry of colours and faces. The fear in the pit of his stomach squeezed at him, and he felt the hairs rising up on the back of his neck in response. Limbs trembling, he staggered backwards, away from the nightmare in front of him. 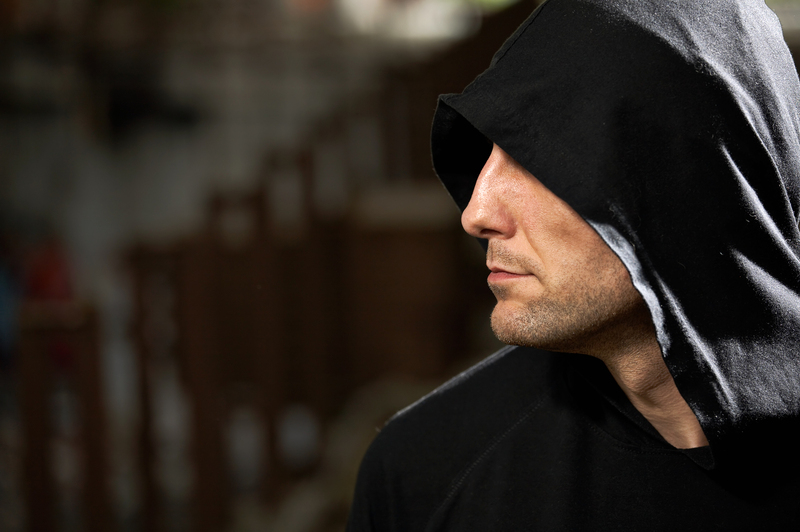 The hooded figure simply crooked its finger again, letting out a deep, mournful sigh. Ryder blew in and out a few calming breaths, drawing himself up and sticking his chin out proudly. Come on, Ryder, what the f*** are you frightened of? It’s a joke. Making the decision firm in his mind, he swallowed back the bile that threatened to erupt from his throat, striding across the hall confidently. His footsteps echoed sharply back to him, the hard rubber soles of his boots hitting the floor with uncustomary heaviness. Stopping just shy of the two figures, Ryder felt a chill travel along his skin, lifting hairs with it in its wake, as he parted his dry lips and passed his tongue across them. “So, who’s the joker? Is it Greg? Matthew? It was Matthew, wasn’t it?” He let out a dry chuckle, his nerves jumping at the croakiness of his own voice. “It’s no use shouting, young man. I’m stood right in front of you, and I can hear perfectly, despite my age,” the cloaked man intoned. His voice boomed across the hall, and the resonance of the tone brought memories of worlds long since passed, of lives come and gone in the blink of an eye. He lowered his crooked arm, the fabric of his cloak whispering as he shifted down the steps to come closer. Ryder lifted his boot as if to take a step back, but held his ground, tensing his jaw. The man paused for a second, holding the staff out for the woman by his side to take. She gripped it silently, grasping the wood with both hands as she brought it before her and rested on it. “What is this? What’s going on?” Ryder bit out, taking the step back with his boot as he swallowed hard to coax saliva back into his dry mouth. The words slammed into Ryder like the truck had slammed into his fragile body. Air seemed to evaporate from his lungs, and he clutched at his throat, wheezing for oxygen as his stomach twisted. Taken from ‘Reaper’s Deliverance’, copyright © Miranda Stork, 2014. A day in the life of a writer equals a day in the life of a hard life. You can do almost anything else and make more money (that being said, it’s not about the money). Writers like me, particularly us “indie writers,” often cannot devote 100 percent of our time to writing. As much as I would like to focus completely on writing, marketing and everything else required of an “indie writer,” I must continually find ways to pay my bills, which means picking up part-time jobs and so forth. For me, there isn’t a “typical writing day.” I write whenever I can make it happen. Being a writer also means being a reader, so you have to squeeze in your reading time too. I usually wake up around 8 a.m. I make a bowl of oatmeal, a pot of coffee, read current events, news, blogs and a book. Then, when I’m fully awake, I work on a short story, a poem, a novel, a play, revising a piece, formatting a work to publish digitally, working on a cover, blogging on my website, http://www.theodorewebb.com, engaging on my social media, http://www.facebook.com/theodorewebbauthor or my Twitter, Theodore Webb @STARLINGCONNECT. 1. Join a writing group or groups. I’m a member of the Morgantown Writers Group (MWG) that meets at the public library as well as the M.T. Pockets Theatre Company Playwrights Group. I’m also a founding member of Morgantown Poets. Between these three groups, I’m often at writers’ meetings several times a month on weekday evenings. These groups keep me busy, inspired and engaged. No one can truly do everything alone. It’s good to be social. If I get overly involved with my own writing or reading, I have a tendency to go too long without seeing people. I’m fortunate to live in a small town with a thriving and supportive writing community. My friends and fellow artists continually inspire me. They tell me what in my writing needs more work. They also help keep me from getting too much inside my own head. 2. Write something new for each group meeting. This is my personal rule for my participation in the groups with which I’m involved. Before every meeting, I must have new writing to share. For example, with the M.T. Pockets Playwrights Group, I must write a new scene before every meeting. 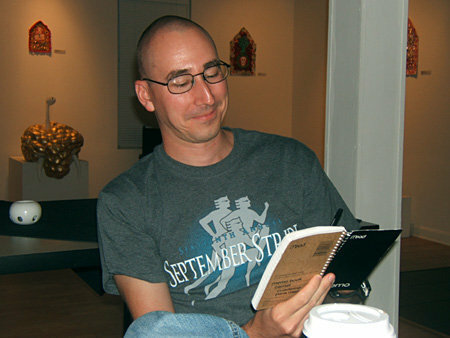 With Morgantown Poets, I try to have at least three new poems to share at every event. Many writers give themselves deadlines. This is my way of holding to a deadline. It ensures that I’m always writing new work. 3. Promote your work. Writers wear many hats. “Shameless self-promotion,” as a friend of mine used to say, is one of those hats. Think about it. You labor for months or years on your novel. And the writing is good. But what good is it if no one knows about it? If you don’t promote your work, then people won’t be able to discover it. I’m continually amazed by how many authors labor to write books, but then do little to promote their books. For those authors who actively promote their books, the competition is stiffer than ever before. Have you looked on Twitter lately? If you’re following authors on social media, as I do, then you’ll notice every other Tweet amounts to “Buy my book!” I don’t think these particular kinds of Tweets are very effective, but I give props to those authors for elbowing their way in there and promoting the heck out of their work. They’re light years ahead of the author who does nothing to promote his book. You have to figure out a strategy for promoting your work. You may find that a fourth of your time or more is devoted to promoting your work while another fourth is engaging with readers and other writers. 4. Chaos is overrated. Organize. Saving time takes time. Schedule about 15 minutes each day to get better organized. Creativity may flourish in chaos for some folks, but it’s frustrating no matter who you are if you’re wasting an hour scrambling through that stack of papers looking for that short story you sketched out a month ago. That said, don’t be a perfectionist. Done is better than perfect. If you’re spending more time trying to organize everything, washing dishes, cleaning, mowing grass or any chore besides writing or promoting your writing, then, as a writer, you’re probably wasting even more time. I’m not saying to neglect your responsibilities, but you need to make sure other members of the family are pulling their weight too. Everyone should be respectful of your time and writing career. The whole family needs to work together for each member to be successful. 5. Don’t forget to exercise daily. You may ask, “How exactly does exercise connect with the writing lifestyle?” I often find I’m spending far too much time sitting behind the screen. We all need a break. As the old saying goes, “All work and no play make Jack a dull boy.” I’m not necessarily talking about strenuous activity. In my 20s, I ran 10-milers. While running many miles can be aerobic, it can also put quite a bit of stress on your bones and joints, particularly if you run on pavement. Today I’m happy simply riding my bicycle a few miles on the rail trail. These bike rides relax me and bring peace to my mind. I often get new ideas or solve a problem with a character or plotline when I’m not thinking about writing. I recommend you find an outdoor activity that is enjoyable to you. It could be walking, swimming, jogging, a short hike in the woods, fishing; simply anything that you find fun. Ideally the activity should involve mild to moderate exercise to get your body and your creative juices moving. Hope this post has shared some insights into a day in my writing life and also given you a few tips that you may find helpful in your own career in the arts. If you’ve found this post helpful, by all means, share this post with your friends and associates. For more writing tips, essays and more, bookmark my website, http://www.theodorewebb.com. Theodore Webb is the author of “The STARLING Connection,” a novel-series about a near-future drone-filled Dystopia in which a group of teenage “hackers” fight for their privacy and freedom to speak. Webb is the author of several short stories, including “Desperate Engine” and “Family Hour.” His electronic books and stories are available on Amazon.com and Smashwords.com. Webb regularly blogs at http://www.theodorewebb.com. “Like” his Facebook author page, http://www.facebook.com/theodorewebbauthor and follow him on Twitter at Theodore Webb @ STARLINGCONNECT. 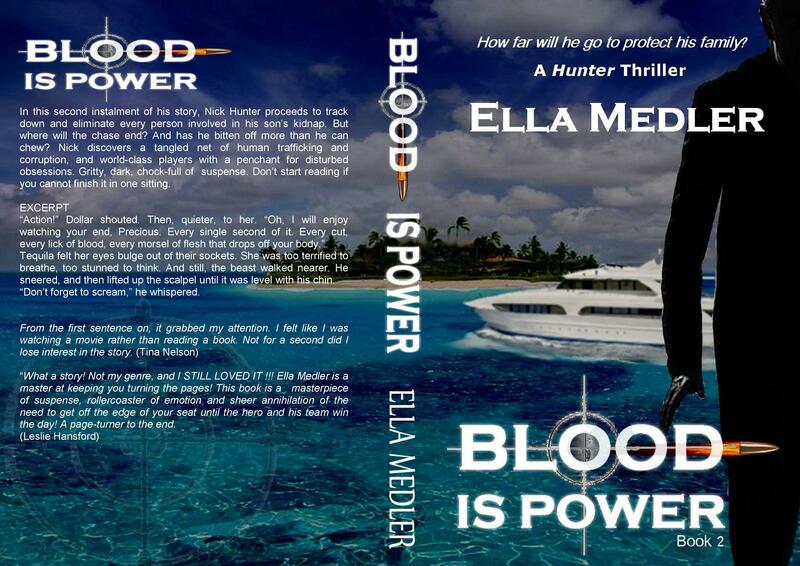 Release Of Blood Is Power From Ella Medler! Nick Hunter used to be a contract killer. Now he’s cut all links to his former lifestyle and can at last relax and live a normal life. He settles down to married life. He has a son. He adores his little family. Unbeknown to him, shadows from his past step forward to shatter his short-lived peace. His wife is dead, his four-year old son kidnapped and it looks like someone is trying to frame him for murder. Under pressure, broken, is there anything Nick wouldn’t do to rescue his son? 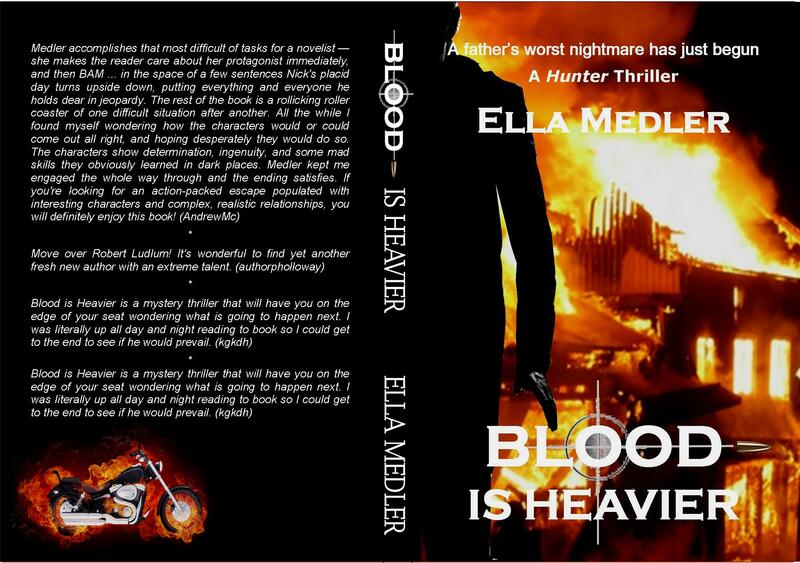 A fast-paced, edge-of-your-seat read that will keep you turning the pages to the very end. Amazon US, Amazon UK, Barnes & Noble, Kobo, Smashwords, and soon in paperback, too. Comfortable in the knowledge that his good mate, Tequila, is perfectly able to look after his loved ones, Nick Hunter does exactly what he shouldn’t do and proceeds to track down and eliminate every person involved in his son’s kidnap. But where will the chase end? And has he bitten off more than he can chew? Nick discovers a tangled net of drugs, human slavery and corruption. Will he enter the lion’s den? Will his family stay safe? Will he be framed for murder? Find out July 19th. Tequila felt her eyes bulge out of their sockets. She was too terrified to breathe, too stunned to think. And still, the beast walked nearer. He sneered, and then lifted up the scalpel until it was level with his chin. “Don’t forget to scream,” he whispered.